'If you have no respect for Torah, respect the Arab rebellion' threatens Eichler, in vitriol on Lapid's VAT housing law benefiting soldiers. 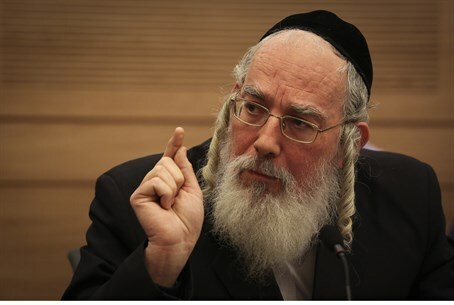 Hareidi MK Yisrael Eichler (United Torah Judaism) warned Israel of an "Arab rebellion" on Tuesday, as the Knesset Finance Committee debated the proposed 0% VAT Housing Law, which was introduced by Finance Minster Yair Lapid (Yesh Atid). The new law would grant those who served at least 18 months in the IDF to save 18% (the amount of VAT) on buying their first home valued up to 1.6 million shekels (almost $500,000). The law hit opposition in that Arab citizens and hareidi Jews who do not serve in the IDF initially were to be excluded - now they receive the exemption for homes valued up to 950,000 shekels. Eichler lambasted the law, saying in the Knesset meeting "if you don't have respect for Jews, have respect for Arabs." "The state which is at war with the Arabs needed to avoid joining the 1.2 million Arab citizens to the violent Arab rebellion by (passing) blatantly discriminatory laws," charged the hareidi MK. Slandering the law, Eichler continued saying "let it be clear what you're doing. Instead of showing that the 'only democracy in the area' does not discriminate between Jews and Arabs, you're demanding on a racial background that Arabs pay a higher VAT to fund their enemies, the settler Zionists." It is worth noting that the law specifically gives benefits to those who served the state in the IDF and does not specifically target Arab citizens, although nearly all Arab Israelis do not serve, either due to the security threat they pose or by their own choice. Warning of an intifada, Eichler stated "don't expect loyalty to 'apartheid' laws like these for VAT. You will bear the responsibility for joining 1.2 million Arabs to the next Arab rebellion." "Don't be surprised that there will be shootings on Highway Six from buildings in adjacent Arab cities G-d forbid. Do you want a ground entry to (the Israeli-Arab city of) Umm al-Fahm to be like (one) to Gaza? Who knows what the consequences of this madness will be," threatened Eichler. "I call on members of the coalition to question themselves before the calamity. Is it worth all this, just to satisfy the loathing for hareidim held by the irresponsible finance minister? Does this financial bribery to the money-hungry Jewish Home justify the harsh decrees on Israel's needy? If you don't have respect for the Torah, have respect for the Arab rebellion," concluded the hareidi MK. MKs from the hareidi parties and the Labor party currently have submitted 2,000 doubts and reservations about the next law, and apparently intend to use filibusters to put off a vote.